Some people are scared of clowns. They probably should be. Clowns are dangerous. 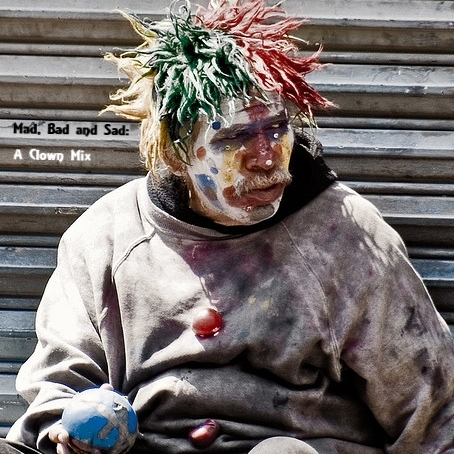 I’ve had the idea of making a mix CD about clowns for a while. I spent a couple of years doing work with the Clandestine Insurgent Rebel Clown Army, and I still put on the nose every so often (hey, there’s a new group starting in Edinburgh, if you’re interested), and I certainly still believe that the clown, who overturns authority, who is neither male nor female, or might be both, who loves and hates everyone in equal measure, who upsets, confuses, and overturns authority, is a figure of extraordinary rebellious potential. But I’m also interested in the darked side of clowns. The nasty clowns, who’ll spit in your face and murder your children. The clown who isn’t interested in playing games of better worlds, who says things just to upset you, who doesn’t care. We harness the clown to fight back against oppression, but we’re a bit frightened of what we’ve set loose on the world, a bit uncertain about what the clown is going to do next. The clown is uncertain too. When I started assembling songs for this project, I was surprised anew at how very few happy clown songs there were. The happiest clowns seem to be the maddest: Circus Contraption and Tom Waits revel in their madness, their outsider status. There are bad clowns here as well, from the horror of Sufjan Stevens’s John Wayne Gacy, Jr to the stupidity of an unnamed political leader in Firewater’s Hey Clown. But the most common clowns are sad clowns. The mix opens and closes with simple, clear versions of two of the most famous clown songs of all, which remind us that beneath the badness and the madness the clown will always be a sad figure, that joy is the flipside of despair, that we are clowns when mired in the ridicuousness of our depression and our disasters — and clowns, always, when we emerge. I’ve tried to bring together as many different clowns as possible for you in this Mix CD project. There’s songs from all over popular music; some of them are silly, some of them are serious (the two being pretty closely related), and some of them are only tangentially about clowns, have clowns on their fringes, the idea of the clown lurking somewhere in the background. The archive downloadable below contains all of the tracks, which should fit neatly onto a standard CDR, so you can listen to it on your computer or burn it, whatever your pleasure. Enjoy.